These socks were designed as a celebration of Cleveland finally winning a championship. Congrats, Cleveland! The Basketball Basket Weave Socks are simple but not boring, the woven stitch pattern shows of the “miraCLE” yarn without competing with it. 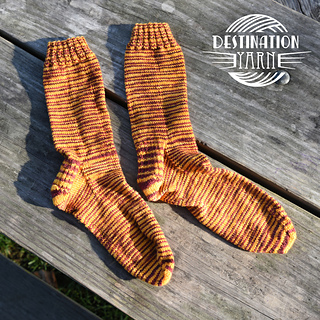 These are the perfect socks for knitting during intense playoff games - or knit nights with friends! The Super Simple Super Fan Sock a simple, stockinette sock. The yarn is the super star here! Dyed in a half/half sequence – where half of the skein is wine and the other half gold – this colorway knits up with approximately 1 row stripes. 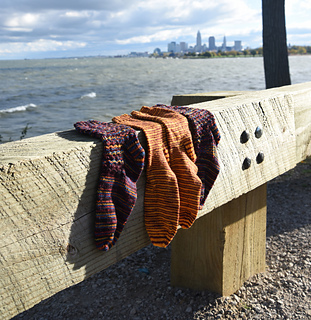 A basic sock will show off that feature of the yarn and highlights both of the team colors. Perfect for the super fan in your life! Want these 2 patterns for FREE? 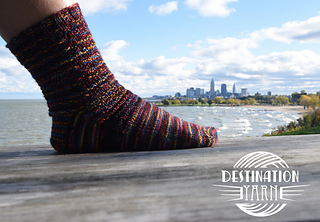 Subscribe to the Destination Yarn mailing list and receive a code for a free download! Click Here.